Occurrence: Garlic is normally added as a seasoning before cooking but can be eaten raw. It is widely used as an ingredient in foods such as stews, hotpots and breads. Allergy Information: Garlic allergy is relatively rare although one case of severe symptoms has been reported after eating garlic. The individual suffered exercise induced anaphylaxis and on a subsequent occasion anaphylaxis without exercise. Symptoms:Kao et al. (2004)  reported that 11/12 patients showed atopic dermatitis, 10/12 allergic rhinitis, 5/12 asthma and 5/12 urticaria. Pires et al. (2002)  reported a 16-month-old boy who developed urticaria on the face and neck immediately after local contact with raw garlic. Perez-Pimiento et al. (1999)  reported a patient who experienced three episodes of exercised induced anaphylaxis after eating when no specific food could be identified as allergenic. The individual subsequently presented generalized urticaria and facial angioedema, followed by a feeling of sickness, hypotension, and loss of consciousness, after eating young garlic with eggs and shrimp, but without exercise. Asero et al. (1998)  reported a patient who suffered systemic urticaria/angioedema after the ingestion of foods containing both raw or cooked garlic. Garlic also caused contact urticaria. Pastorello et al. (1989)  reported a single patient with rhinitis and diarrhoea on reintroduction of garlic after an elimination diet. Kao et al. (2004)  used two concentrations of purified garlic alliin lyase in phosphate buffered saline. Pires et al. (2002)  used commercial garlic extract (Stallergènes), fresh raw and fresh cooked garlic. Commercial onion extract (Stallergènes) and fresh raw and cooked onion were also used. Perez-Pimiento et al. (1999)  used commercial pollen extracts. Raw and cooked young garlic and garlic clove were used in prick-prick tests. Asero et al. (1998)  used commercial extracts of garlic (Dome-Hollister/Stier and Lofarma Allergeni, Milan) and other foods. Protocol: (controls, definition of positive etc)Histamine dihydrochloride 10 mg/ml and physiological saline were the positive and negative controls. A positive response was defined as a mean wheal diameter at least 3 mm bigger than that seen with saline after 15 min. Kao et al. (2004)  tested 12 patients. Pires et al. (2002)  tested 1 patient. Perez-Pimiento et al. (1999)  tested 1 patient. Asero et al. (1998)  tested 1 patient. Kao et al. (2004)  report that 12/12 patients (and 0 controls) gave positive SPT to 1 × 10–8 mol/L of purified alliin lyase whereas 58% (7/12) also gave a positive response with the lower concentration of 2 × 10–9 mol/L. Pires et al. (2002)  report that skin prick and prick-prick tests were positive with commercial garlic extract (Stallergènes) and fresh raw garlic with a wheal diameter of 15 X 9 mm and 17 X 8 mm, respectively. The prick-prick test was negative with fresh cooked garlic. Skin prick and prick-prick tests were negative with both commercial onion extract (Stallergènes) and fresh raw and cooked onion. Perez-Pimiento et al. (1999)  report positive SPTs with pollen of grass, trees (Platanus, Ulmus), and weeds (Artemisia, Taraxacum, Parietaria, and Chenopodium). SPTs were also positive to almond, hazelnut, peanut, walnut, sunflower seed, mustard, and Anisakis. In the prick-prick test, raw young garlic produced a wheal of 23 X 14 mm. Heated young garlic and garlic clove gave wheals of 8 X 4 and 10 X 6 mm, respectively. Asero et al. (1998)  report a strong skin reaction (wheal grade 4+ by comparison with 10 mg/ml histamine) was induced by two commercial garlic extract. No reaction was seen with onion or any other extract tested. Commercial extracts were used with immunoCAP. Number of Patients:Kao et al. (2004)  used sera from 15 patients with allergy to garlic in immunoblotting and sera from 12 patients for comparison of CAP, SPT results and symptoms. Kao et al. 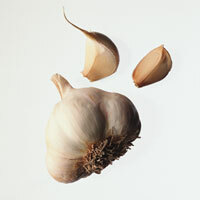 (2004)  reported that 2/12 patients were class 1 and 10/12 patients class 2 for garlic specific IgE. Pires et al. (2002)  reported that specific IgE to garlic and onion (Pharmacia CAP System) were negative (< 0.35 kU/l). Kao et al. (2004)  made a crude garlic extract (also shallot, Allium ascalonicum, leek, Allium porrum, and onion, Allium cepa) by homogenizing for 6 × 30 seconds, with an interval of 30 seconds in ice-cold 50 mM phosphate buffer, pH 7.5, containing 1 mM PMSF, 1 mM calcium chloride, and 0.1 mM DTT (10 mL of buffer per gram of material). The homogenate was filtered through two layers of gauze and the filtrate centrifuged at 27,000 x g for 15 minutes at 4°C. Trichloroacetic acid was added to the supernatant solution (crude extract) to a final concentration of 20% and after standing for 15 minutes at 4°C, the sample was centrifugated at 12,000g for 15 minutes at 4°C and the pellet vacuum-dried on a SpeedVac (SC110, Savant, Farmingdale, NY). The pelleted material was analyzed by 2-dimensional (2-D) electrophoresis. An immobilized pH gradient of 3–10 on a horizontal electrophoresis system (Multiphor II, Pharmacia) was used for the first dimension. The second dimension used SDS PAGE with a separation gel of 12.5% polyacrylamide under reducing conditions (5% beta-mercaptoethanol). Asero et al. (1998)  extracted garlic proteins by stirring some cloves overnight at 4° C in 0.15M phosphate-buffered saline (pH 7.2) in the presence of 2% (w/v) polyvinylpolypyrrolidone, 10mM diethyldithiocarbamate, and 2mM ethylenediamine tetraacetic acid disodium salt. Particulate material was removed by centrifugation at 18,000xg for 30 minutes, and the supernatant was dialyzed against distilled water and lyophilized. Twenty micrograms of garlic extract was applied on a running gel (gradient 10% to 20%), and electrophoresis was carried out at 40 mA for 2 hours. Kao et al. (2004)  transferred proteins on to PVDF membranes (Millipore) by semi-dry blotting. The blotted membranes were then either stained directly with Coomassie Brilliant Blue R-250 or blocked with 1% skimmed milk in Tris-buffered saline, 20 mM Tris/HCl (pH 7.5) with 500 mM NaCl, at room temperature for 1h then incubated overnight at 4°C with patients' sera (pooled serum from patients 1 through 4) diluted 1:10 in Tris-buffered saline containing 1% v/v Tween-20 (TBST) and 1% w/v skimmed milk. After three washes with TBST, the blots were incubated with anti-human-IgE/alkaline phosphatase antibody (1:2000) for 1h at room temperature and development was carried out using a mixture of Nitro Blue Tetrazolium/5-bromo-4-chloroindol-3-yl phosphate toluidinium as substrate. Asero et al. (1998)  electrophoretically transferred proteins onto a nylon-cellulose membrane (Fluorotrans 0.45 µm; Pall, Milan, Italy). The membrane was saturated with 0.1 mol/L tris-buffered saline and 5% w/v fat-free milk powder and incubated with patient's serum after washings. Bound specific IgE (before and after adsorption on Protein A; see below) were detected by peroxidase-conjugated anti-human IgE antibodies from goat (1:1000 in saturation buffer) by using an ECL western blotting kit (Amersham, Milan, Italy). To verify if the presence in serum of anti-garlic extract IgG could interfere in the signal, the patient's serum was also adsorbed on Protein A-Sepharose CL-4B (Pharmacia, Milan, Italy). One milliliter of serum was added to 300 mg of not preswollen resin to avoid dilution of serum. After incubation for 3 hours at room temperature and centrifugation, serum was recovered and used in immunoblotting experiments. Kao et al. (2004)  report that 5 proteins bound IgE from the sera of 4 patients with similar masses of approximately 56 kDa. The spot at highest pI, 8.5, was excised and N-terminal amino acid sequencing gave the sequence KMTWTMKAAEEAEAVAN, which is identical to the N-terminal sequence of the mature form of garlic alliin lyase. The other spots with pI between 8.5 and 7 showed closely related sequences from MALDI mass spectroscopy. The apparent molecular weights of the IgE-binding components identified by all 15 sera ranged from 31 to 60 kDa. The 56 kDa component was detected by all 15 sera. Other IgE-binding components of various molecular weights were detected at frequencies of less than 30%, for example, serum samples 3, 6, 10, and 13 gave a positive reactions to a 42-kDa component. Pires et al. (2002)  found two IgE binding bands with molecular masses of approximately 12 kDa and around 40-50 kDa, which they suggest probably correspond to the mannose-binding lectin and alliinase. Perez-Pimiento et al. (1999)  report that IgE from the patient's serum bound to a band at a molecular mass of approximately 12 kDa from raw young garlic (stem and bulb), garlic, onion, and leek. Other 12 kDa bands could also be observed with extracts of mugwort pollen and hazelnut. The serum also recognized an intense IgE binding band of about 22 kDa in mugwort pollen. Asero et al. (1998)  reported that there was weak binding of IgE to a garlic protein at 10 kDa. Adsorption of the patient's serum on protein A to remove IgG antibodies resulted in an intensification of the 10 kDa band and the appearance of further signals at about 20 and 40 kDa (and a possible band near 100 kDa). Number of Patients:Pires et al. (2002)  challenged one 16-month-old boy. Symptoms:Pires et al. (2002)  reported that oral challenge with raw garlic was positive with generalized urticaria within 10 min after ingestion. Oral challenge with cooked garlic was negative. The Liliaceae family is divided into two subfamilies: Aliolideas (garlic, onion, chives, and leek) and Asparagoidea (asparagus). Sanchez-Hernandez et al. 2000  report IgE cross-reactivity between asparagus and onion. However, the patient of Perez-Pimiento et al. (1999)  only reacted to young garlic and tolerated garlic cloves, onion, asparagus, and leek several times. The patient of Pires et al. (2002)  had ingested cooked garlic with tolerance from the age of 12 months and had ingested onion from the age of 6 months with no symptoms. Asero et al. (1998)  report that occasional weak positive reactions are found on SPTs with commercial garlic extract in birch pollen–hypersensitive patients but that these patients can tolerate garlic. The immunoblotting data of Perez-Pimiento et al. (1999)  suggests possible IgE cross-reactivity between garlic and mugwort pollen. Moneret-Vautrin et al. (2002)  in a survey of 589 cases note that sensitization to Liliaceae (garlic, onion and chive) is observed in 4.6% of prick-tests in children and 7.7% of prick-tests in adults. The effects of cooking garlic seem to either reduce the allergenic potency (Perez-Pimiento et al. 1999)  or to eliminate it (Pires et al. 2002) . Garlic is a well-recognized cause of allergic contact dermatitis (Delaney et al, 1996 ; Sinha et al, 1977 ; Burgess, 1952 ), but may also produce an irritant rash, as well as urticaria or a protein contact dermatitis (Jappe et al. 1999 ). Patch testing using neat garlic, or other spices, is known to give rise to false-positive irritant reactions (Kanerva et al. 1996 ). Diallyl disulfide is believed to cause this reaction. Pires et al. (2002)  report that contact challenge was positive (urticaria) with raw garlic and negative with cooked garlic in a 16-month-old boy. Garlic can also be an occupational aeroallergen (Lybarger et al. 1982 ; Bassioukas et al. 2004 ). Kao SH, Hsu CH, Su SN, Hor WT, Chang T WH, Chow LP. Identification and immunologic characterization of an allergen, alliin lyase, from garlic (Allium sativum). Pires G, Pargana E, Loureiro V, Almeida MM, Pinto JR.
Jappe U, Bonnekoh B, Hausen BM, Gollnick H.
Garlic-related dermatoses: case report and review of the literature. Kanerva L, Estlander T, Jolanki R.
Occupational allergic contact dermatitis from spices. Moneret-Vautrin DA, Morisset M, Lemerdy P, Croizier A, Kanny G.
Asero R, Mistrello G, Roncarolo D, Antoniotti PL, Falagiani P.
A case of garlic allergy. Perez-Pimiento AJ, Moneo I, Santaolalla M, de Paz S, Fernandez-Parra B, Dominguez-Lazaro AR. Anaphylactic reaction to young garlic. Sanchez-Hernandez MC, Hernandez M, Delgado J, Guardia P, Monteseirin J, Bartolome B, Palacios R, Martinez J, Conde J.
Allergenic cross-reactivity in the Liliaceae family. Rabinkov A, Zhu XZ, Grafi G, Galili G, Mirelman D.
Alliin lyase (Alliinase) from garlic (Allium sativum). Biochemical characterization and cDNA cloning. Pastorello EA, Stocchi L, Pravettoni V, Bigi A, Schilke ML, Incorvaia C, Zanussi C.
Role of the elimination diet in adults with food allergy. Sinha SM, Pasricha JS, Sharma R, Kandhari KC. Vegetables responsible for contact dermatitis of the hands. Occupational dermatitis due to onion and garlic. Lybarger JA, Gallagher JS, Pulver DW, Litwin A, Brooks S, Bernstein IL. Occupational asthma induced by inhalation and ingestion of garlic. Bassioukas K, Orton D, Cerio R.
Occupational airborne allergic contact dermatitis from garlic with concurrent Type I allergy. Process, chemical, enzymatic:Kao et al. (2004)  report that alliin lyase binds lectins and is thus almost certainly a glycoprotein. Allergen properties & biological function:Alliin lyase or alliinase (EC 4.4.1.4) catalyses the production of allicin (thio-2-propene-1-sulfinic acid S-allyl ester), a biologically active compound which is also responsible for the characteristic smell of garlic. Allicin may be an anti-microbial defence compound. Kao et al. (2004)  purified alliin lyase from garlic, leek, shallot, and onion by two chromatographic steps on HiTrap Q-Sepharose and Sephacryl S-100. Rabinkov et al. 1994  purified alliin lyase from 60 g. of garlic cloves homogenised in sodium phosphate (90 mls, 20 mM, pH 7.2) containing 10% v/v glycerol, PMSF (1 mM) and pyridoxal phosphate (0.02 mM) (buffer A). The homogenate was filtered twice through cheese cloth and the filtrate centrifuged at 20000 x g for 30 minutes. Polyethylene glycol 8000 was added to 25% (w/v) and the mixture stirred for 20 minutes. The slurry was centrifuged at 20000 x g for 15 minutes. The pellet was resuspended in 120 mls of buffer A and centrifuged at 20000 x g for 20 minutes. The supernatant was loaded onto a hydroxylapatite column (2.2 x 50 cm, DNA-grage bio-gel HTP, Bio-Rad), washed with 50 mM sodium phosphate buffer (pH7.2) and eluted with 0.3M sodium phosphate buffer (pH7.2). The eluate was brought to 50% saturation with sodium sulphate, stirred for 30 minutes and centrifuged at 20000 x g for 15 minutes. The pellet was redissolved in 2mls of 0.1M potassium phosphate (pH7.2), diluted with the same volume of sodium sulphate (2M) and loaded onto an HPLC hydrophobic interaction column (7.5 x 75 mm, Ultrapac TSK Phenyl 5PW, LKB). Fractions were eluted with a gradient of 1.0-0.0M sodium sulphate in 0.1M potassium phosphate (pH7.2) and alliin lyase activity identified. All steps were at 4°C. The involvement of carbohydrate groups in the antigenic and allergenic determinants of garlic alliin lyase was suggested by a reduction in IgE binding in immunoblots after periodate oxidation of PVDF membranes bearing the purified garlic protein (Kao et al. 2004) . The DNA sequence was initially determined by Van Damme et al. (1992) . Van Damme EJ, Smeets K, Torrekens S, Van Leuven F, Peumans WJ. Isolation and characterization of alliinase cDNA clones from garlic (Allium sativum L.) and related species.